As cultural landmarks go, the Saigon Opera House falls easily into the ‘right under your nose’ category. 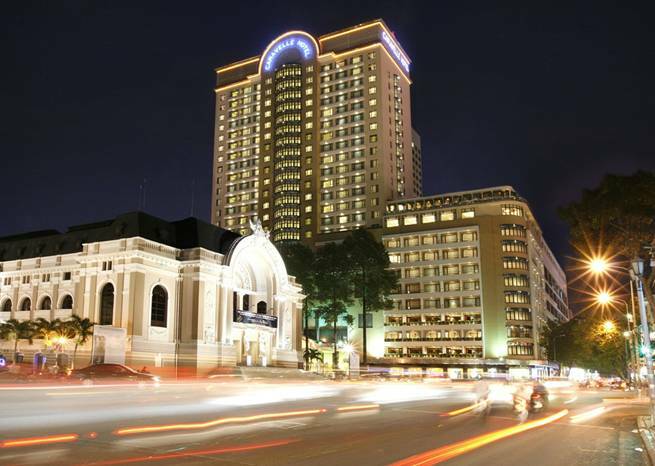 The 115-year-old theatre reigns majestically over bustling Lam Son Square, the historic and cinematic heart of Ho Chi Minh City. Traffic pours into the square at all hours from the arteries of Le Loi, Dong Khoi and Hai Ba Trung, whirlpools around the Opera House, and shoots out at some other corner. Captured on hundreds of DSLRs every day, lit up like an oversized music box in a sea of motorcycles, the nucleus of Vietnam’s most progressive city is impossible to miss. And yet as long as I’ve worked at the Caravelle Hotel just opposite the theatre, I’ve had the sense that the vast majority of visitors do miss, or at least overlook, the building at 7 Lam Son Square. A venture up the steps, a stroll past on the sidewalk, a few obligatory wide-angle shots are not enough to appreciate the building’s century-long story. Built in 1897 under the direction of three French architects to a design specified by Monsieur Ferret Eugene, the façade of the Opera de Saigon as it was then called was an echo of the Petit Palais, built the same year in France. Its revolving stage and three-tiered 800-seat galleries soon became a stopping point for touring French troupes. For a time, evenings at the Opera de Saigon provided cultural diversions and world-class shows to the city’s thriving middle class. But as the mood shifted between WWI and WWII and the expatriate community flocked to dance halls and nightclubs for their after-hours entertainment, audiences at the theatre dwindled, and performances grew more sporadic. In the early 40s, together with the rest of the country, the building entered into a turbulent period that lasted more than three decades. In 1943, some of the ornaments and statues on the theatre façade were removed after being criticised as overly ornate. The following year, the building’s exterior was further disfigured in Allied air raids. Its halls sheltered French civilians fleeing North Vietnam before being occupied by the lower house assembly of the State of Vietnam in 1955. After the Fall of Saigon in 1975, the building was renamed the Ho Chi Minh Municipal Theatre and took up its original function again. The exterior was restored and the interior renewed in 1998 to mark the 300th anniversary of the founding of Saigon, yielding the Opera House that greets tourists today. From the street or from the windows in the old wing of the Caravelle Hotel, you can glimpse a pair of luminous statues of the Goddess of Art gazing out over the stone veranda, and the winged angels resting atop its central arch. But the real aesthetic value of the building’s classical European style is best appreciated from inside the theatre. An evening at the opera is still a viable excuse – perhaps the only one left — to dress to the nines. On performance nights, a stylish stream of guests ascend the stairs and are greeted on the marble-tiled first floor, before being seated in the auditorium beneath a ceiling awash in Greco-Roman engravings. During intermission, guests spill from the halls onto small verandas to take in the evening ambiance of the street outside.